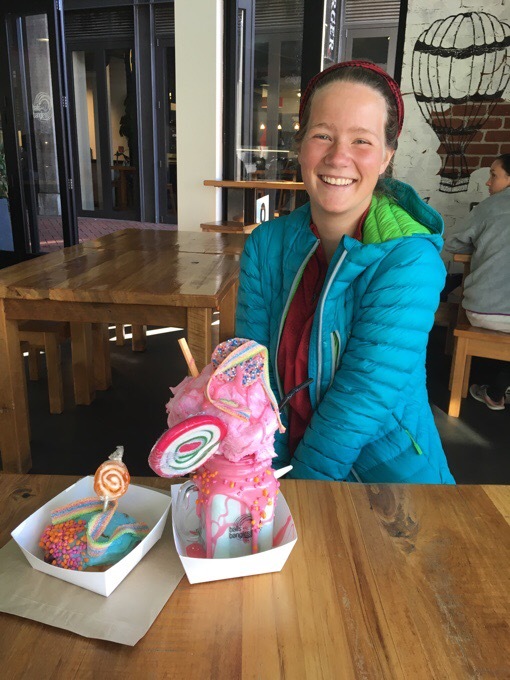 Day 106: Becky’s Queenstown Birthday! Today was the big day, Becky’s 2-1! It was a jam packed day with plenty of activity in “The Adventure Capital of the World.” We started off with a visit to McDonald’s for breakfast immediately followed by a visit to Balls and Bangles, an awesome donut shop. They had donuts with syringes in them to inject your own filling. Fellow TA hiker Calvin joined us for the day as well. Most of us ended up getting the massively insane shakes they have there. Only on a hiker’s stomach could we eat such a thing, and we had to indulge! The shakes we got were the Fluffy Unicorn, Kernel Carmel, and Hospital Pass. Becky and Calvin also had donuts called Sweet and Sour Ball and Granny’s Pie. 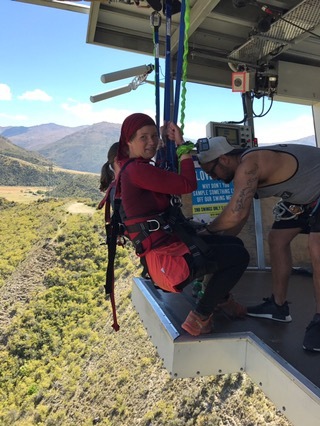 Then we checked in at AJ Hackett Bungy. 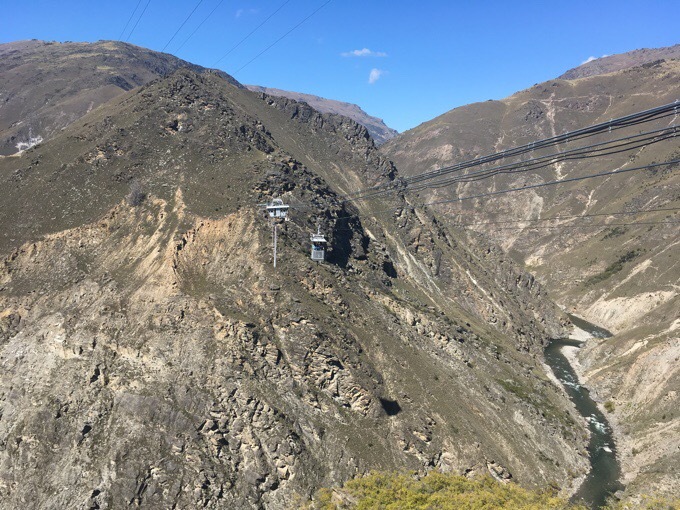 Bungy was invented here in Queenstown, so this is the place to do it. 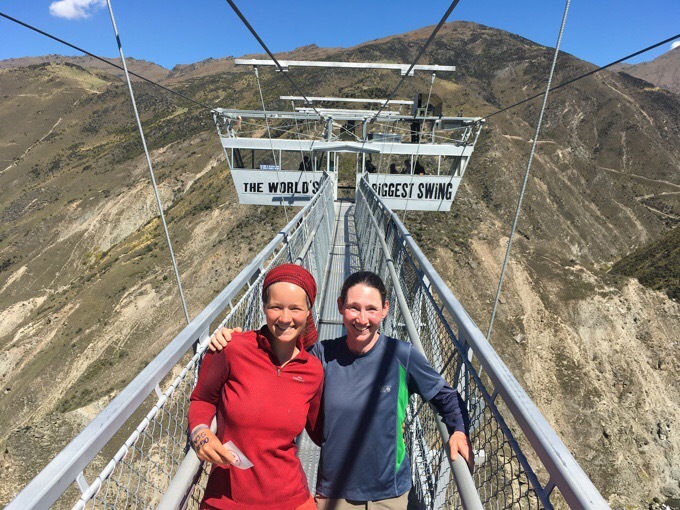 We chose the highest option of the Nevis Bungy and Swing. 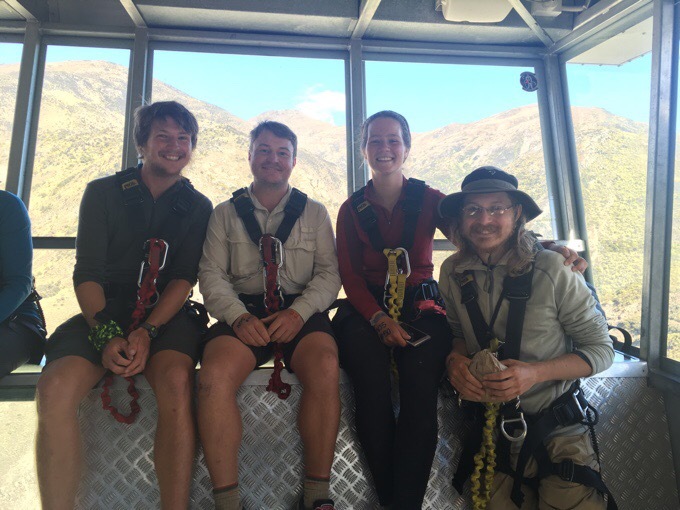 Griggs and Tom did the bungy and Becky and I did the swing, which is the world’s biggest swing. We all got to watch one another go, and it was quite entertaining. 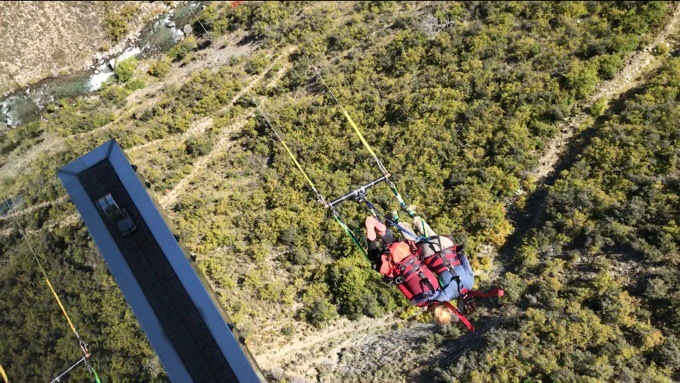 Where the bungee takes place. Tom and Griggs loved it. I’ve never seen Griggs so elated as when he came back up from that jump! Tom returning and Griggs prepped to jump! 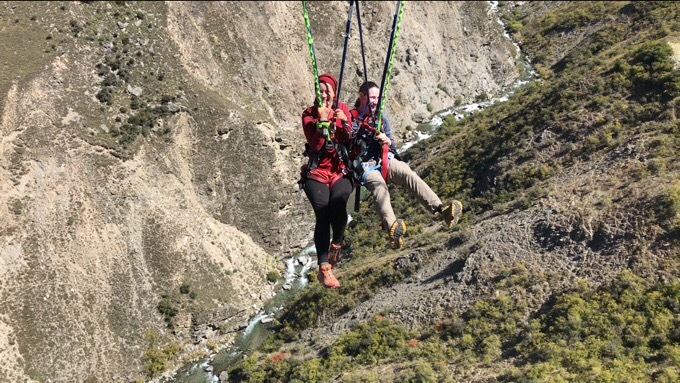 Then we headed over to the swing, which Becky and I were able to do tandem. It was quite a wait for us at the end of the line, and that built up the suspense. 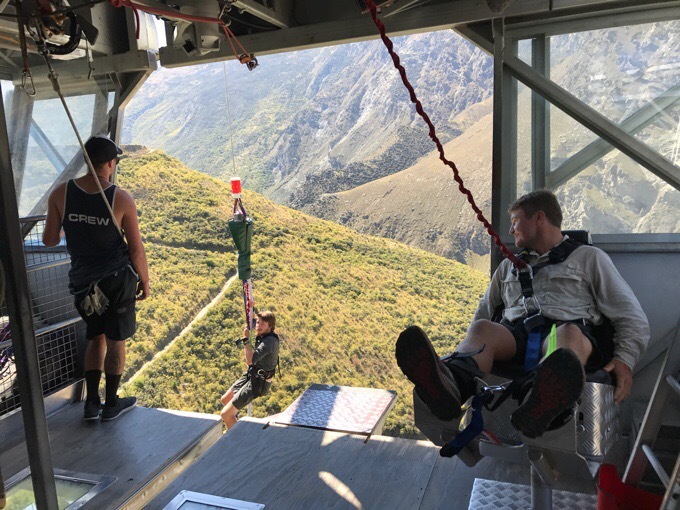 We get to choose what way we’d like to face, and chose upside down facing outward to the canyon the way we’d fall 229ft/70m and then swing 984ft/300m. They got us hanging out over the ledge and then we needed to flip over on our own to be upside down. I won’t say who, but one of us (cough, cough) found this process quite frightening, and it took a bit to feel ready. 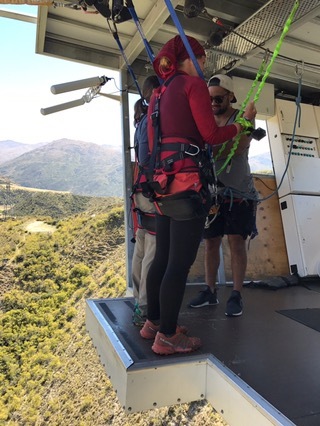 Once ready, they randomly pulled the cord and we were droppppped! It went fast. I thought I’d feel like my stomach was dropping but I didn’t. It was more like dropping on a rollercoaster without the stomach drop. Just really fast falling. Once swinging, we undid our legs and went right side up. I immediately felt the pressure in my head from being upside down so long. We did it! Of course, as we were being brought back up, Becky immediately yelled that she wanted to do it again, ha! Becky did get the official video and photos they sell, and that should be available for us to download tomorrow, but I will be hiking and won’t be able to get long videos uploaded for possibly awhile. I was able to piece together a video of all our jumps and get it uploaded! Here is all our jumps in the order of Griggs, Tom, and then Becky and me. Glad I was able to get that! 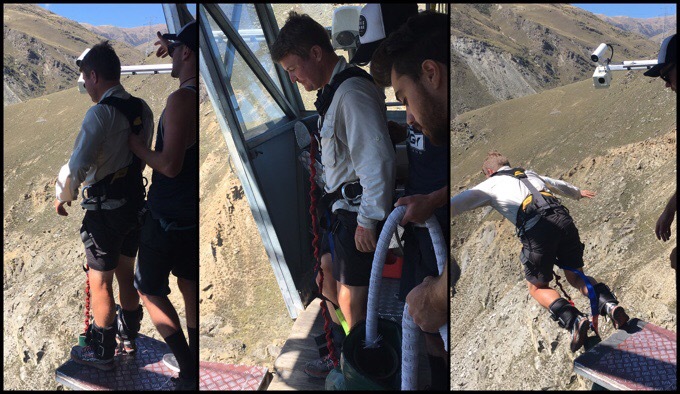 Yes, they play very loud music at the bungy and move fast to keep people from hesitating. Then we had the 1hr bus ride back to Queenstown. I’ve been on quite a lot of bus rides lately, and my car sickness was crept in again. It seems to be getting successively worse each day with so many bus rides lately. 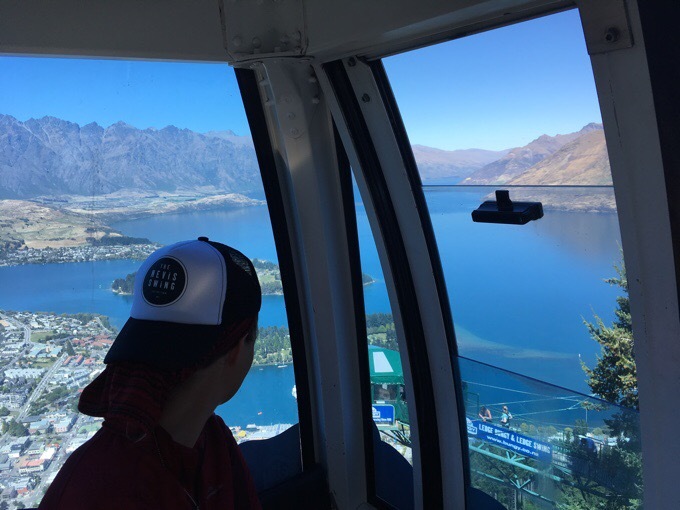 When we got to the city, we had plenty of time, so we took the gondola up that overlooks the city and did the luge track they have up there. It was a random and fun to do. Kinda like go cart racing downhill and then riding back up on a ski lift. 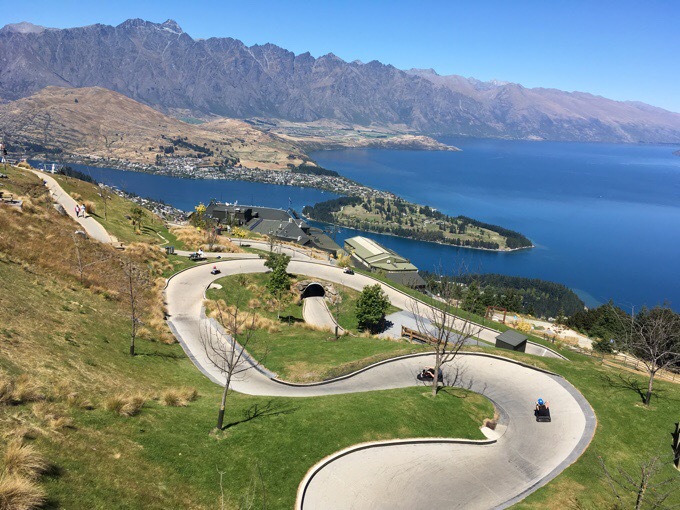 This city has everything with mountain bike riding, bungy jumping, and parasailing just a stones throw away and everything so well oiled that you could impulsively just walk up and do it all in one day. 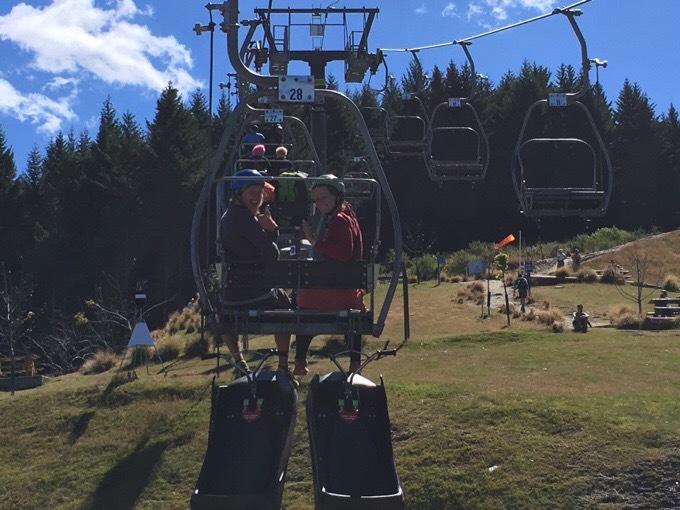 Taking the ski lift back up! 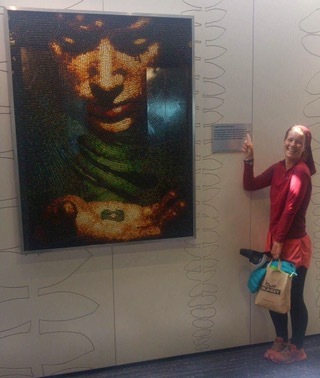 Lord of the Beans made out of Jelly Bellys. Becky’s two loves! 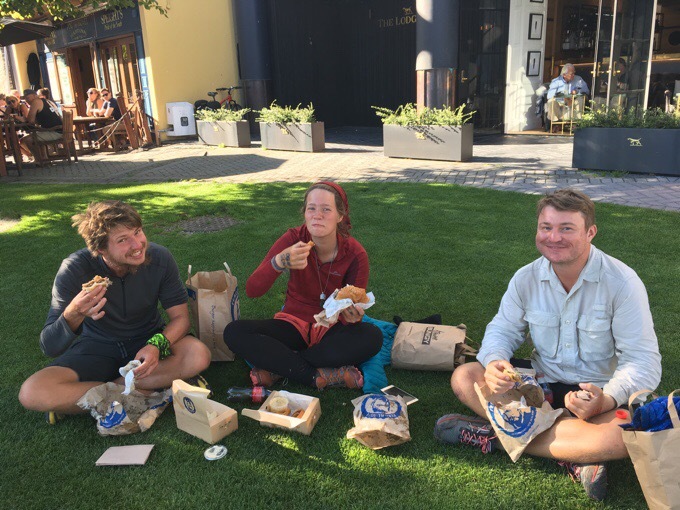 After the luges, we went to Queenstown’s famous Fergburger, and I sat this one out. Way too nauseous to eat, which wasn’t great since I hadn’t eaten since breakfast. I didn’t even want to smell food, much less ingest it. Everyone else enjoyed it and we sat by the lakefront with the burgers. After that, we returned back to the hostel for awhile and Becky, Tom, and Calvin chose to head back out to a bar. Griggs and I sat that one out, and I just needed to be still. I did cave and buy some motion sickness medicine since we are on another bus tomorrow morning. I took it with two hiking bars and hope it helps! Man, quite the eventful 21st birthday for Becky! I was going to wait until tomorrow to mention this, as I didn’t want to end on a bit of a down note, but it is part of this day. During our time together, I got to talk to Becky and Tom about what our future weeks could look like. They understandably are in a different place in life than me, and with this being their first thru-hike, don’t want it to end. Just this past week alone for them was stretched out as much as you possibly can. In the meantime, I’ve checked off most of what I’d like to do while I’m waiting. Well, most of what I’d prioritize over Tasmania as their shoulder season inches up. No matter how much I want it to work, I can’t reason waiting as long as they may take to get to Queenstown and how slow they would like to go the final weeks. Just yesterday, I truly believed it would be possible, reality set in as we realized that Becky and Tom will be taking much longer than I had hoped. Really looking at it today, it’s just far too much for me to wait with a lot of unknowns and too many variables when I need to book flights and dates for things. Plus, Griggs and I are on a roll (no we are not a “couple” so that’s not the main factor here), and it’s tough to leave that to wait for an unknown for a couple more weeks. These last few days for us doing side trips have been great, but I’m running out of things I want to prioritize over Tasmania. There are many slots still available to hike the Overland in mid March over early April, and that gives me a much better chance of better weather in a place where it is quite rainy and cold regularly. It also gets me home three weeks earlier, which after eight months of hiking, I’m quite looking forward to. 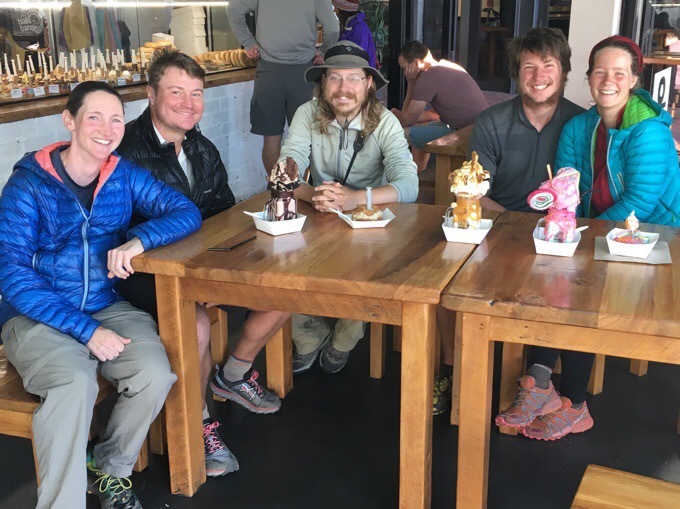 I’m very happy for Becky and Tom that they are loving their first thru hike experience so much, and I understand that they want to soak it up in the final month or so when they have the real world waiting on the other side. They are young and living life to its fullest. We all have different ways of doing it that make each of us enjoy the hike. Sometimes, no matter how much we want it to work, the pieces just don’t fit. We all are bummed yet happy for one another, and really want the other to be happy. I will update everyone from time to time over the next month as Becky and Tom head south as I know we all were looking forward to sharing this experience with them. It’s not an easy decision, but deep down we know it’s what is best for all of us. It was a great final day together, and the pairing with Becky really did make this hike special and memorable. Tomorrow we all head out on buses. Becky and Tom back to Twizel, and Griggs and I up to Wanaka to do one more side trip at Mt Aspiring National Park for about 5 days before returning to the TA. Believe me, if you’re feeling disappointed by this shift, it’s nothing compared to what I feel. We all wanted it to work, and it did come down to a decision I had to make as to how long I could reasonably wait. Sorry to disappoint, but it really is the option that will bring all of us through this last leg of the journey in a positive way. It was wonderful to get such a fun last day together. Bittersweet, but fitting in its own way. The trail calls! I may not have service the next few days in Mt Aspiring. I think that it is the way it was fated to be, Erin .. . I think you did very well to be with Becky for as long as you were. Keep those updates coming! Happy birthday Becky! You guys really celebrated in style! She will never forget her 21st birthday! Sad you guys can’t hike together but at least you realise you are doing your hikes differently now and respect each other. You never know, maybe you will team up for another thru hike one day! BTW my mum uses motion sickness bands versus tablets. She finds they work well – maybe worth a try especially if the pills make you feel yuck. I may get to that point. A 21st is a special event (long time ago for me) and I think it was very good of you to share it with Becky while she is so far from home and family. Now you can “walk your own walk”. Enjoy without any regrets. Hey Wired, I like your happiness at having such a friend as Becky even though you two won’t finish this trail together. I am happy that Griggs is such a great hiking partner. The more friends the better! I will continue to follow the odyssey. What a day ?-so full of thrills . I think things are falling in to place the way they are intended , and even though you and Becky won’t be hiking together , you will still be there for each other . You’ve got a such a strong bond , and I’m sure at some point in your lives you will meet on a trail, for another hike …. she’ll have the bug and I predict she’ll be heading to see you in the USA , after she’s walked her walk in New Zealand . As for your adventures , you’re about to start the next chapter , and I’m looking forward to whatever your feet take you . Thanks for taking me with you . For sure. The PCT is in her future! What a great way for friends to come together to celebrate, and not just for Beckys Birthday. It has actually been kinda cool seeing all the pieces fall into place the way they have for this entire trip. I get sick if I’m not driving so maybe on your next bus, just take the wheel ?? Not. It’s been an interesting hike and how it’s all flowed and evolved. I agree with driving instead of being a passenger. Sorry for your disappointment in not being able to continue hiking with Becky. I guess one of the best things about aging is knowing yourself well enough to understand when things aren’t meant to be, no matter how much you want them to work. But still, a fabulous birthday celebration and a remarkable set of friends. Congratulations. Yeah, a very tough decision, but I’ve learned the hard way not to force these things on trail when hiking paces aren’t compatible no matter how close of friends you are. Good on you Erin. And hope you and Griggs have a great end to your hike. Trying to listen to my gut and not what I wish would happen. Tough one. I had a friend who got carsick on anything but a very short trip.. she tried everything but was successful with the wristband. I guess soon you will be back and grounded without needing vehicular travel. I know it was difficult to come to your conclusion but it sounds right for everyone in the long run and with you all being online, I trust that you will be able to meet again, whether you travel to Germany, or Becky comes to the US to hike, or somewhere in between. We have all had our lives brightened from knowing Tom and Becky through you, but I know there are more adventures in the World of Wired that I need to follow… so onward we go. Hopefully there will be future hikes that might include Griggs, as well. He is another great guy .. always nice to see how enthused he is. And that was quite a birthday celebration, too. Yes, there’s always something new waiting around the corner. You’ll be happy to hear that flights have just been booked and Griggs is coming to Tasmania with me! Oh, that is fabulous.. ? 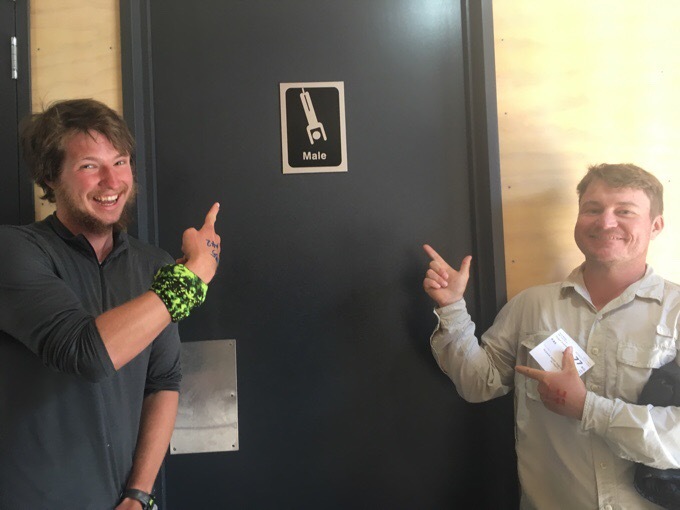 ?you two will take Tassie by storm! And thing of the animals.. Tasmanian Devils, Wombats and Platypus.. among others…..
We actually heard many stories of deaths up there, so it apparently does happen…in foul weather, but for us it was quite tame. It seems to be a thing though. Wow. That’s it. Just wow.